Ah, thanks for pointing out the BIOS update. However it didn't change anything related to the issue. 1) The one to test is at the very top line at the top of the page (not the daily folder). 2) The release names are irrelevant. 3) The folder time stamps aren't indicative of when the kernel actually was released upstream. 4) Install instructions are available at https://wiki.ubuntu.com/Kernel/MainlineBuilds . 1) Install Ubuntu to a different partition and then test this there. 2) Backup, or clone the primary install. Ah no, I was to quick to judge. Now the error occurred with 4.5rc5, but it is less frequent. And the quality of the glitches change. No more repetition errors, just "regular" graphic errors. Hubert Hesse, the next step is to fully commit bisect from kernel 4.2.0-27 to 4.2.0-30 in order to identify the last good kernel commit, followed immediately by the first bad one. This will allow for a more expedited analysis of the root cause of your issue. Could you please do this following https://wiki.ubuntu.com/Kernel/KernelBisection ? After the offending commit (not kernel version) has been identified, then please mark this report Status Confirmed. So it turn out when I rebuild the package for 4.2.0-27 I already see that glitches occurring in that specific kernel version. So it look like there is difference between the package I built and the official package or I screwed up the build process? Can you check if those steps should produce a correct package? Can anyone confirm the steps I took where all right? What's the difference between the kernel I compiled and the officially distributed one (4.2.0-27)? Any patches to reproduce the official binary? Same problem for me. I can easily reproduce a problem my moving mouse over youtube video borders. If it's needed I can record a video. Should I do that? What can I do to help determine the cause of a problem or fix it? Also a funny glitches happen with Google Documents very often. Christopher, I hope I did everything right. Hi all, I was bugged by this both in Ubuntu 16.04 (any 4.4 kernel after release) and in ArchLinUX with all actual 4.5 kernels. My solution was to take the 4.6 kernel on ArchLinUX (testing repository), after which I was cured from all difficulties. If you use VirtualBox with a new 4.4/4.5 kernel in your client, you get very often bugged by this failure. --> If you can, use LinUX kernel 4.6. I can also confirm that upgrading to 16.04 and using a 4.6 kernel (http://kernel.ubuntu.com/~kernel-ppa/mainline/v4.6-yakkety/) solves the issue for me. Hubert Hesse, the next step is to fully reverse commit bisect from kernel 4.5-rc5 to 4.6 in order to identify the last bad commit, followed immediately by the first good one. Once this good commit has been identified, it may be reviewed for backporting. Could you please do this following https://wiki.ubuntu.com/Kernel/KernelBisection#How_do_I_reverse_bisect_the_upstream_kernel.3F ? After the fix commit (not kernel version) has been identified, then please mark this report Status Confirmed. If I understand correctly we should install different linux kernel versions untill we find a kernel, that fixes bug? I'm a bit confused what link I should use to sort out kernels. Can you suggest, please? Try kernels from http://kernel.ubuntu.com/~kernel-ppa/mainline/ from v 4.4 to 4.6. ? @Christopher To demand a full bisect for the status "confirmed" is IMHO much over the edge, especially as it takes some time to trigger the bug. [Út čen 14 00:11:03 2016] nf_conntrack: automatic helper assignment is deprecated and it will be removed soon. Use the iptables CT target to attach helpers instead. @pavel See https://wiki.ubuntu.com/Kernel/MainlineBuilds and try which newer kernel solves the issue. I was having this same problem running kernel 4.4.0-28-generic in 16.04. Upgrading to kernel 4.6.3-040603-generic seems to have resolved the problems (or at least made it rare enough that I don't notice it anymore). On 4.4 the graphic errors were particular common (every few seconds) when using gotomeeting or other video chat web sites that use WebRTC via Google Chrome (with Chrome video acceleration turned off). The screen going blank for 1 second problem seemed particularly common when alt-tabbing between Gnome Terminal instances. The "*ERROR* CPU pipe A FIFO underrun" in dmesg has also stopped. Correct to my previous comment. 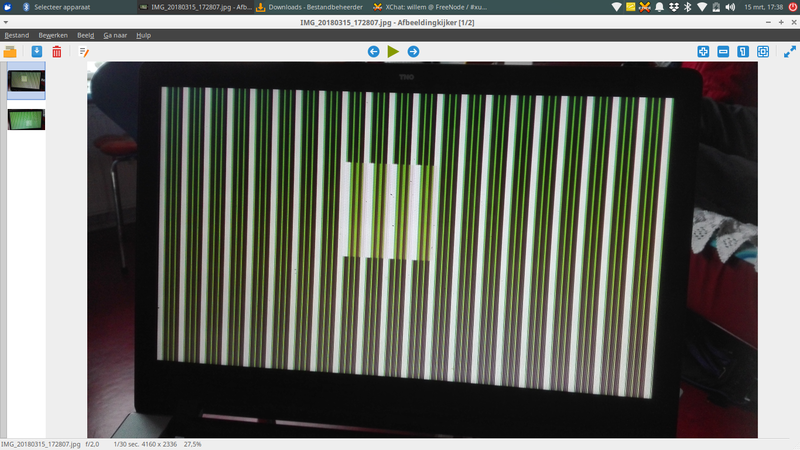 After running on kernel 4.6.3-040603-generic I do still see the "funny repetition patterns (back in time glitches)", but it seems less frequent. The other problems (black screen and buffer underrun in dmesg) have not recurred. I actually switch back to my x230 and don't have the hardware for testing, but we should really bisect this issue so the current xenial kernel can be fixed. "There's one thing I still don't understand... the root of the problem was identified in https://bugs.freedesktop.org/show_bug.cgi?id=91393#c25"
The associated patch http://patchwork.freedesktop<email address hidden> revert two commits identified there. @Hubert Of course it doesn't need a bisect when you already know the commit the fixes it :) But i would sugest that we try to get it fixed in xenial's kernel first. Unfortunately i can't assign the kernel team, can you help out here? bhat3, unfortunately, we don't know if the commit fixes it, as it hasn't been tested on the original reporter's (Hubert Hesse) hardware. Hubert Hesse, regarding your question, bisecting the Ubuntu kernel can be tricky, hence you are better off refocusing onto the reverse bisect of the mainline kernel to confirm the fix commit, and reverting it causes the issue again. @penalvch Thanks for the info, but can you assist us on how to test and get a fix in xenial's kernel. I am out of kernel packaging since 2.6.33 and want to help to make xenial working on Thinkpads with docking stations. bhat3, if one thinks they have identified a fix commit, they may test it via https://wiki.ubuntu.com/Kernel/KernelBisection#Testing_a_newly_released_patch_from_upstream . I found the bug in all the 4.11 and 4.10, but not 4.12rc1 or 4.12rc4. NOTE - @Jochen - I dont see the FIFO underrun error while running the 4.12 kernel. @Chris; by starting my Dell Latitude 6410 this morning I see this FIFO underrun error again booting into emergency mode. This is strange, because last Friday and Saturday I did not have any problems. Tried other distros and Kernel versions. I can only boot to emergency mode. The system is only stable in graphics mode right after installation. [ 1130.350050] drm: not enough stolen space for compressed buffer (need 29491200 more bytes), disabling. Hint: you may be able to increase stolen memory size in the BIOS to avoid this. [ 1146.868877] [drm] Reducing the compressed framebuffer size. This may lead to less power savings than a non-reduced-size. Try to increase stolen memory size if available in BIOS. If I get the problem again, are any specific log files of interest? I'm on kernel 4.13 and got this error message as well. The external monitor connected to laptop (Razer Blade Stealth) flickers a lot. Just an update, setting a `i915.enable_rc6=0` kernel parameter helps and the issue is gone but, as this switches of CPU and GPU energy saving, it's rather a temporary workaround not a final solution. Kernel 4.13.2 working ok for me, run for an hour without issue so far. Will report back after more testing. I hope 4.13 kernels will work well, they will be in the Ubuntu 17.10 series and it would be nice to get back off the mainline kernels! I've just tried 4.13.2, screen is still blinking while on with the default i915.enable_rc6=1. There is an improvement though. On the kernel version 4.13 my laptop was totally crashing after hitting caps-lock twice. Now this ridiculous one is at least gone. Although I still need to keep the rc6=0 flag at kernel boot params to prevent screen flickering (an external one, connected via HDMI). I see graphic errors on external monitors and following messages in logs with 4.13.0 kernel. Errors appear after laptop works for 3-4 days without reboot. I started seeing computer lockups with kernel 4.13.0 reporting a "fifo underrun on pipe B" when a multiple monitor setup enters power save state. It's nearly 100% reproducible. No issues with just the laptop screen, without an external monitor. I've just upgraded to 17.10. As 4.13.2 is reported to resolve some issues above, is is on the way to the distros? I have the same or a similar problem on kernel version 4.13.4, Ubuntu 17.10. Same issue here, DELL XPS 15 9560, I noticed the error because my Gnome Lock screen clock "stops" at the point when I locked my screen. Looking at journalctl, the last message before the clock stopped is "Jan 15 10:21:05 hamide-XPS kernel: [drm:intel_cpu_fifo_underrun_irq_handler [i915]] *ERROR* CPU pipe C FIFO underrun"
Not sure what's the workaround. I don't see the problem when I use laptop's display. Same issue here on a Lenovo T450s with a Intel HD Graphics 5500 (Broadwell GT2) GPU. It happens both with Ubuntu 16.04 and Fedora (26 and 27) so I suppose that's a weird bug in the intel driver. It also happens sometimes without any external monitor when I leave my notebook powered up during the night: in the moring my gdm lock screen flickers and I'm unable to login into my session. Has someone found a workaround or a fix? And the bug is still there. Although it wasn't manifesting itself until I've connected an external screen (may coincidence though). Not sure will it help in your case but have you tried setting kernel boot flag? It's workaround not a fix, I'm afraid. I keep experiencing this issue, using Ubuntu 17.10, an Intel Core i3-5005U (with Intel HD 5500). It appears most often when a new notification comes in (Slack/Spotify) and the lockscreen is visible. i915.enable_rc6=0 as a workaround doesn't seem to work. I have similar symptoms as Angelo Lisco. I leave laptop on overnight and sometimes in the morning it got frozen with same underrun error message in logs. This still occurs for me on kernel 4.15.12. Like others, this still occurs on 4.15.13-041513-lowlatency with a clean install of 16.04. However, please note: It ONLY occurs if I am connected from my laptop's docking station (HP 840 G2) to an external monitor (HDMI or DVI same issue), AND the laptop lid is DOWN. If the above is true i get the same error, or the funny graphics, etc. However, if i keep the laptop lid OPEN, even though i am still connected to the external screen, i have NO problem booting up. For me this manifests in lockups. The hardware buttons on my laptop still work, fans etc. but xorg basically hard locks (Kernel 4.15.12). There is no monitor in play. I am running Ubuntu 18.04 since about a month. No problems so far, until i made an update 2 or 3 days ago. Since then i have the same problem. Messages in dmesg with underrun, flickering screen etc. It happens all the time. This happens on my htpc so i am not able to watch TV longer than 5-10 minutes, then it starts again with flickering. I also tried that rc6_enable-workaround, did not help. Still happening on 4.16.6 kernel for me. Often when the screen starts flickering and goes black there is the sound of really heavy disk activity, maybe more than justifiable by sys-logging. Lenovo ThinkPad T480 on a dock and DP monitor connected. Both screens go black when trying to unlock the session and I have to restart the laptop. [ 17.177991] EDAC pnd2: Failed to register device with error -22. [ 60.934218] logitech-hidpp-device 0003:046D:400A.000D: HID++ 2.0 device connected. This ticket is from 2016. A fifo underrun is a clear problem. I can reproduce this easily with my external monitor. What information do you need to look at this? Hubert Hesse, to confirm this is resolved for you in Ubuntu, could you please either upgrade your 16.04 enablement stack as per https://wiki.ubuntu.com/Kernel/LTSEnablementStack or test http://cdimage.ubuntu.com/daily-live/current/ and advise to the results? Still a problem in 18.04.1 with the latest HWE kernel. The flickering and the system crashes are gone, but the error still persits in the logs.